With a win in the bag and plenty of work-ons for Joe Schmidt, the mission to Murrayfield can be deemed a success. Defeat would have been unimaginable, adding a perfect performance to the victory would have been fanciful. "If you were to ask me before today if I'd take a 22-13 victory here, I'd have leaped at it," he said. And with two weeks to prepare for a game against a struggling Italy team there's time to iron out a few issues. After setting such a low bar in last week's game against England, this was always going to be an improvement. Just as the New Zealander noticed something was off before losing their first tie and grand slam chances, Schmidt sensed that his charges were closer to pitch this time. "It's not even something that you want to say but there was definitely a rise in temperature; definitely an increase in energy," he said about the build-up in comparison to last week. "You've got to have a lot of energy when you make as many tackles as we did in the first-half. "We've got to make sure we kick on from here." Kicking on from here will be collecting five match points in Rome from an Italy side with two defeats on their record. 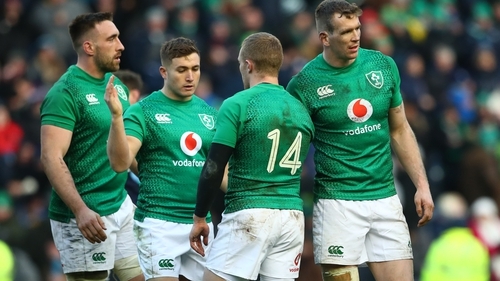 There's certainly a base to build on and even if Johnny Sexton fails to recover from a head knock, a swollen ankle and a dead leg, his deputy Joey Carbery will do a solid job. "When you come to Murrayfield and get a win, they get one try off an intercept and we score three, when you break it down like that, it's a great win because they are a quality side. But there's lot of things we can improve on," Chris Farrell, the centre who replaced the injured Garry Ringrose, said. But Ireland spent too much time on the back foot in the opening half, the defence stood firm to repel a 25-phase move at the end of the period but that they were stuck there in the first place is the issue. The work-ons will include the loose kicking. Almost perfect execution in this department was a feature of Ireland's 2018, something has gone wrong. "34% of the first half was spent in our 22," pointed out the head coach. "We didn't have the ball there. Effectively, we spent over 70% of the first half in our own territory. "Our kicking game was not where it should be and that made it difficult," Schmidt said plainly. Asked about wayward kicks, one from Johnny Sexton and two from Conor Murray, that were taken by the Scottish backs in wide open Murrayfield spaces, he said: "It was just a cohesion issue. We've got to get better at that." There were a couple of loose ones against England too. "Our kicking game is a strength, as a rule. We'll be looking to remedy a few of those things. "Conor started taking a bit more responsibility when Johnny was feeling a little bit sluggish. "He was trying to kick from positions that he wouldn't normally kick from and when you do that sometimes it goes awry." Scotland, who Ireland meet in their opening World Cup game next September, had not been beaten at home in the championship since 2016 and head coach Gregor Townsend was asked to appraise the champions' performance: "We always expect a really good set-piece play." In fact, Ireland's lineout and scrum stats were immaculate and they disrupted three of the Scots' throw-ins. '[Jacob Stockdale scored] an outstanding try, credit to Joe, and the players for executing it. "They were very good in contact." Make no mistake, winning in Edinburgh was the be all and end all for Ireland's hopes of retaining the crown, claimed in such a devastating fashion last year. Without the bonus point, the result leaves Ireland in fourth place in the table, one behind Scotland and England and four off Wales. But the bonus is getting over the line while recognising that there is a lot of work to be done to stay in contention. As captain Rory Best acknowledged: "There was a different kind of pressure [from the possibility of losing two in a row]] but we're back now to the pressure we put on ourselves to perform. "Ideally we'd like to play better, with more fluidity than we did today, get on the front foot more." "It was most important to get the result. In certain areas we want to be better. Physically and emotionally we were where we want to be."